In response to a national need for more STEM-H (science, technology, engineering, mathematics, and health sciences) graduates, Winston-Salem State University is committed to increasing the number and diversity of future scientists. The new Sciences Building will play a critical role in that endeavor. With design and construction plans complete, the Sciences Building simply awaits funding to welcome a new generation of students into a high-quality learning environment designed to help them meet the challenges of the 21st century. The state-of-the-art facility will serve as a hub of innovation, discovery, and application that will attract and support faculty and students with diverse academic interests. Designed to provide open, interactive and flexible learning and collaboration spaces, the Sciences Building will facilitate collaboration across disciplinary boundaries to advance the frontiers of scientific knowledge. 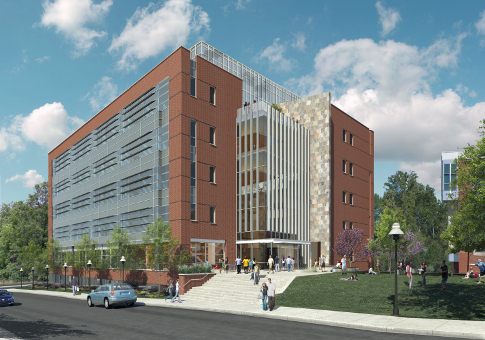 The building, slated to have more than 100,000 square feet of space, will anchor the Science District of the WSSU campus, complementing the Elva J. Jones Computer Science Building, the F.L. Atkins Health Sciences Building, and the W.B. Atkinson Science Building. The building will feature laboratory and learning spaces for multiple academic programs across the sciences, including biology, chemistry, physics, and health sciences. In addition, the building will house the university’s biomedical research infrastructure center, bringing all science laboratories within close proximity to significantly increase faculty and student collaboration. The new Sciences Building at Winston-Salem State University will showcase the university’s unique integration of teaching and research by providing students with an unparalleled learning environment. The facility is one more way Winston-Salem State University is transforming the future of higher education.